UPDATE: WE HAVE A WINNER! Do you love the look of soldered jewelry, but feel totally intimidated by that hot freaking iron and molten metal? My creative friend Hope is here to break it down for us in a detailed How to Solder Jewelry video that demystifies the process and will have you making jaw dropping pieces lickity split! As if that isn’t enough, Hope has teamed up with Saved By Love Creations to give you lovely readers a chance to win your choice of 3 gorgeous pendants! Hope invited me in to record her process! Before jumping into the video, I want to let you know the supplies you see will being used are from GlassSupplies on Etsy, a shop owned by Robin Ramsden. This tape used in the video is 3/8 inch wide copper backed foil tape, which you can get at the linked store and probably elsewhere. Hope recommends black backed foil tape for most simple projects since it holds the pieces together better and is just strong/less frustrating for us newbies! She was out of it or we would have been using it for sure. It is available in the linked shop above (GlassSupplies on Etsy). Obviously if you are using thicker glass pieces than we did, you may need wider tape. You will have to experiment. More info on supplies is found below and in the video tutorial. I took my pendants to Hope’s with me and she helped me figure out how to make them more what I was going for. I learned so much from hanging out with her that I haven’t seen elsewhere. It turns out I wasn’t using near enough solder, and oh yeah, my soldering iron tip is disintegrating. There is a solution for that, and many soldering woes. 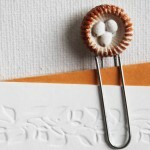 This woman solders A LOT and is a wonderful resource! She is also super sweet, so if something isn’t covered that you want to know about, you can find her on Facebook: Hope Ellington. She even takes custom orders, although she is pretty swamped with them right now from what I have seen so hurry if you are interested. There were so many tips and tricks that I had to break the video up into 2 parts, and they are still long. You will learn a ton, and if you are like me, your soldering will be vastly improved. I made a pendant this morning and love it! Don’t worry, you will see it soon. Now for the best part. You get a chance to win a free handmade soldered pendant from Hope’s Bloomington Indiana Shop, Girlfriends on the Farm! I found these cool new pendant blanks by Mod Podge at Michael’s a couple of weeks ago, and have been waiting for some inspiration (and time) to create with them. 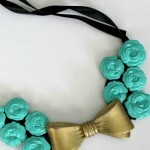 This Mod Podge® Antique Urban Pendant Necklace Tutorial at Michaels.com is just the nudge I needed. Have you created with these pendant blanks and papers? If so, do share. Disclosure: This is a sponsored post on behalf of Blueprint Social and Plaid. All opinions are my own. 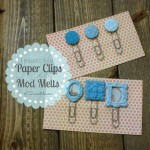 Have you seen the new Mod Melts and Molds by Mod Podge yet? This stuff is fantastic! 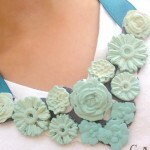 As one who works with resin and polymer clay, I am in love with the ease of use, the detail of the pieces you can create and the speed of the process. Today I will show you how to quickly create a beautiful daisy bracelet. You will be seeing several more pieces in the near future made during my afternoon of creating with Mod Melts. Heat the Mod Melt stick in your HIGH temp hot glue gun and squeeze into the larger daisy on the flower mold. Work from the center out, making sure to not overfill. The pieces easily pop out of the flexible mold when you bend it. This is so freaking cool. Have you ever used resin in a flexible mold? Hours upon hours of waiting. No more. Now you just paint your daisy. 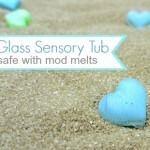 Mod Melts can be painted with acrylics, alcohol inks, embossing powders and more. 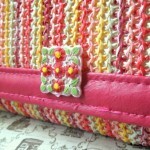 See Cathie Filian’s great photo examples of different ways to color the embellishments. I show you FolkArt and Martha Stewart acrylic paint in this tutorial. I also tried alcohol inks and Vintaj patina. So awesome! I painted the middle of the daisy with a toothpick. Here are the three pieces I sandwiched for the focal point of the bracelet. I sealed them with 2 coats of Mod Podge Matte finish, painted on with small, soft brush. I used E6000 to attach the pieces. Let dry for at least 30 minutes before handling. To make the bracelet, I opened chain links and attached them directly to the metal filigree flower using jewelry pliers. Using pliers and a jump ring, I added toggle clasp to the ends for closure. Give it a try. You are going to love it! 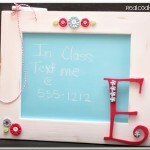 You can find more great ideas and products from Plaid by via Facebook, Pinterest, Twitter, and Paint Me Plaid. Vacationing in South Florida has put me in a sea glass craft mood. The stuff is so beautiful, and I love that it is just waiting on the beaches to be harvested. Sea glass, also referred to as beach glass, comes in a variety of colors and is used to create gorgeous art, jewelry and home decor. I love the wire wrap pendants and charm bracelets featuring the ocean tumbled and smoothed recycled glass. Don’t live near a coast? No fear. 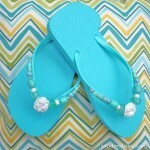 You can order sea glass on line, or try out one of the many faux DIY sea glass tutorials below. As always, if you have a favroite sea glass project that I missed, let me know and I will take a look to see if it fits in the collection! So you may have heard me and my creative bloggy friends mention SNAP!, a conference that took place last month in Utah. It was amazing to meet these ladies face to face, and share ideas, laughs, even some dance floor moves. We get into the details, us creatives. 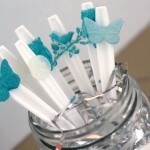 You should have seen the business cards all dressed up with washi tape, glitter, clips, candies and on and on… Rebecca at the Crafted Sparrow embellished hers with little aqua paper feathers to hers. In all the room chaos, I must have ended up with my roommate’s Crafted Sparrow business card, but no fear. I put it to good use. When I got home and started sorting through my stash, I saw the 2 paper feathers and knew earrings were necessary. You can make them too, no problem. If you didn’t happen to get 2 of Rebecca’s cards with feathers, you can die cut your own, or just download this free feather template and use it to hand cut your feathers from pretty paper! Apply resin to paper feathers. I did both sides (when one side dries, flip it over and do the other). For my thoughts on Magic Glos resin, check out my patriotic sprinkle earrings tutorial. You can also use Mod Podge Dimensional Magic or 2 part resin, but you will have to wait overnight for these to dry before moving on to the next step. With Magic Glos the wait is 20 minutes in sunlight or under a UV lamp. Poke a hole in the tip of your feather where the stem starts, and set your eyelet. 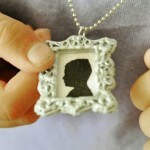 For the best explanation of how to do this with tiny eyelets, go to Retro Cafe Art Gallery’s post on DIY acrylic tags. That is how I did it, but I used a the pointy end of an aluminum crochet hook because I didn’t have an eyelet setter tool. Cut about 5 inches of wire and insert into eyelet from front to back of feather. Bend wire up with a one inch tail as in photo. Loop tail around to form coil as shown. I wrapped four times. Cut off excess wire from tail if necessary. String beads onto wire on top of coil. I used 2 small faceted beads on either side of a larger crystal. Bend wire at 90° as shown. Leave a space between the bend and the top bead for coiling the wire (see below). Loop wire around round nose pliers as shown. TIP: When making earrings, I like to mark with a sharpie where on the pliers I wrap the wire so that I can make the loop on the next earring the same size. Slide ear wire finding onto loop, making sure you have it oriented so that when you put it in your ear, the side of the feather that you want to be the front is facing towards the front. Wrap the wire to the top of the bead, forming a coil as shown. Clip the excess wire off with the wire cutter. Today brings a fun, simple Mother’s Day gift DIY using Martha Stewart Crafts glass etching cream to create customized glass tile pendants! As I mentioned Monday when I showed you my doily etched wine bottles, this etching cream is simply amazing. No glass is safe around me now! 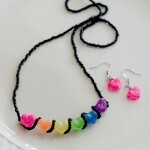 Read on to see how to make these lovely pendants in no time! Clean glass tiles with rubbing alcohol. Tape off area you don’t want etched and apply thick layer of etching cream. Wait 15 minutes and then rinse cream away under faucet. Make sure to clean stencils well. Find area of paper you want as background. Trace pendant and cut out paper for backing. 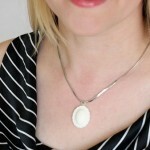 Using double sided paper gives the back of your pendant a pretty, finished look. 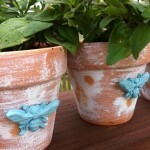 Use your favorite decoupage medium to adhere backing to tile. When that is dry, sand edges to even things up a bit. Seal paper backing with your favorite medium. 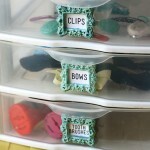 I love the antique Mod Podge. Apply 2-3 coats, allowing 30 minutes dry time between each. Adhere pendant bail using E6000 or other industrial strength adhesive. Let your bail set overnight and add your chain to finish! I love them! I made one for my grandma, mom and sister. What a cool way to add a special touch to customize glass tile pendants. Use a meaningful photo instead of scrapbook paper as an alternative. 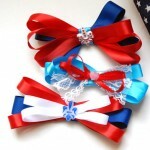 Make them as wedding/anniversary gifts with the couple’s wedding date! The possibilities are endless. 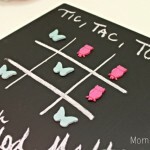 Be sure to check out the other Mother’s Day and Father’s Day projects my cohorts are making with Marth Stewart Crafts in the list below this post. FOLLOW PLAID CRAFTS WITH ME!! Disclosure: I wrote this post as part of a sponsored campaign with Plaid and The Blueprint Social. All opinions are honest and mine! It has been a whirlwind of a weekend at SNAP 2013, and I can’t wait to share all of the creative awesomeness with you. I missed you while I was away and it’s good to be back! 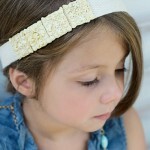 Today I am over at the Sizzix blog sharing this funky metal square embossed bracelet. I wear the thing all of the time. It has quickly become a favorite since it goes with so much and I love the design. Go check out the easy step by step. Stay tuned for some terrarium fun and so much more! Happy spring time SBLC friends! 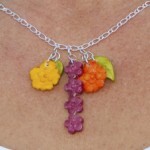 Amy here from Plucking Daisies to share with you how to make some sweet springtime charms. 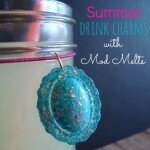 These charms are super easy to make and use for a variety of crafty ventures! 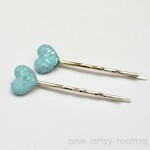 You can use them for custom jewelry pieces, ornaments or even wine charms for your Easter Brunch or spring celebrations! I used my charms to decorate an Easter Bunny Tree. 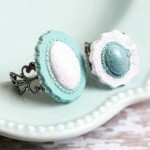 They are a lovely addition to my spring table decor and oh so charming! 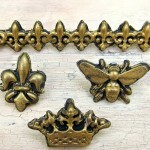 You can make your own charms for adornments, jewelry, gifts and pretty much anything you can dream up. Grab your favorite images and prepare to be “charmed”! You can select any image you like to use when making your charms, a favorite photo (color copy), old greeting cards, a childs artwork…the possibilities are truly endless! For my charms I used these delightful vintage Easter Images from Tim Holtz Seasonal Paper Stash. STEP 1: Apply Glossy Accents to the back of your charm and press down onto image. STEP 2: Flip paper over and use a credit card or craft scraper to press out any air bubbles. STEP 3: Allow to dry for several hours then trim off excess paper. To finish and complete the look of your custom charms you can easily create a metal backing with Ranger foil tape sheets. Not only will the foil tape enhance the look of your charms, it will also smooth any rough edges and ensure your image stays put. STEP 3: Peel away the backing of your embossed foil tape and press cut out charms onto it. 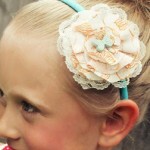 Cut around the charm leaving a slight edge all the way around. 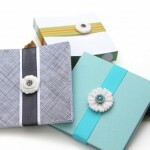 Fold edges over onto charm to secure your image. Now that your charms are complete you will need to hang them. Whether you will be using them for jewelry, gift wrap or decor you can customize how you hang them just as easily as you made them! STEP 2: Reapply Alcohol ink to blending tool and stamp (DON’T swipe) onto Metallic ribbon. Use your stamped ribbon to create pendants, ornaments or “Charming” gift toppers! I used aged bronze Vintaj paint, then aqua over that, and sanded to give a distressed look. Seal with Vintaj Glaze. For the image, I printed it on cardstock with laserjet, hand doodled with Pitt Pen and added Tim Holtz word sticker with Glossy Accents. I sealed the entire image with Mod Podge and sandwiched it between front and back pendant rectangle. Then I used my metal punch to place holes in top on both sides and the center of all 3 layers (hammer and nail would work too). I am loving these tiny Instagram photo blocks, shared at Intimate Weddings. The project is similar to scrabble tile pendants that have been so popular over the last several years. They are super easy to make, and could be used to create custom photo pendants and embellishments for cards, decor and art!